Looking through a series of historic maps from the 1600s to the mid 1800’s, one can see that there has always been a slight fissure or opening in the dense urban fabric of Katarina Parish at Mosebacke Square (torg = square). The oddly shaped space resulted from the junction of two street systems: the right-angled grid following the Götgatan (map 1) artery leading from Gamla Stan (map 2) and the terraced streets following the cliff face along Södermalm’s edge at the Stadsgården harbor. Apparently the city already had plans to make this fissure into an official square when a large part of the parish burned down in 1857. The fire made space for a much larger square than the original left-over wedge—now an entire city block is left unbuilt for this neighborhood oasis. 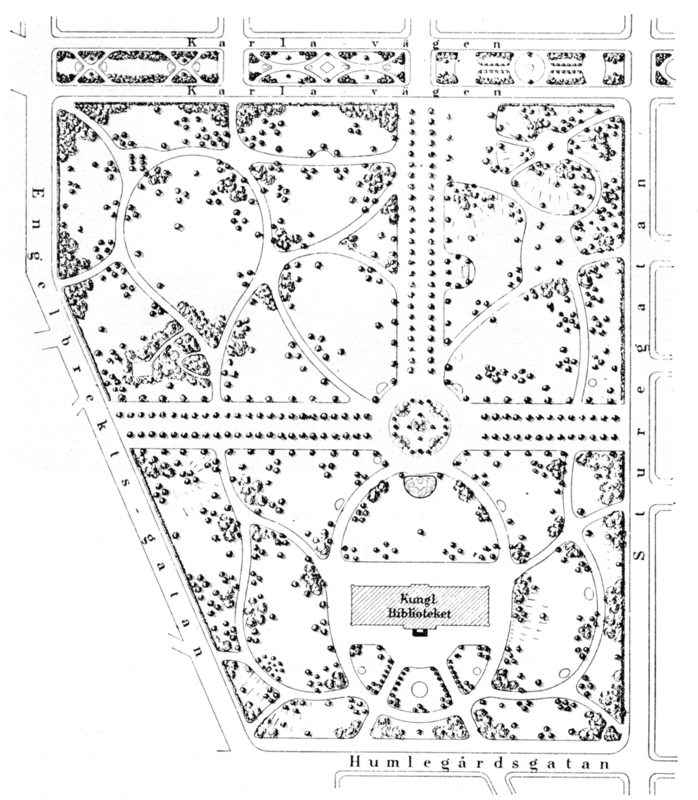 The square was planted with trees in a symmetrical arrangement and was from the beginning meant to be a green haven. The building stock directly around Mosebacke Square was for the most part built after the Katarina Fire cleared away the smaller-scaled, more rural landscape, but just a block away, a number of buildings from the 1700’s survived. 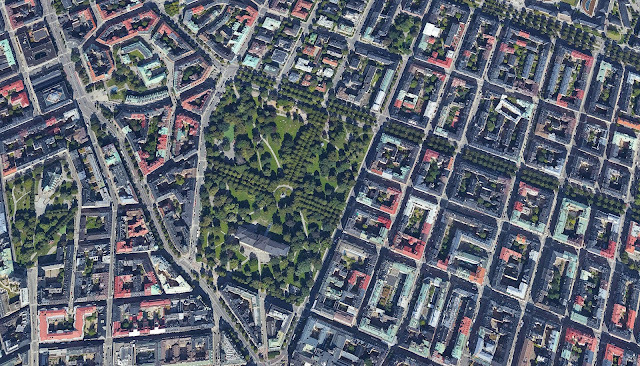 The neighborhood’s mostly poor residents certainly had use of a central green space, but I surmise that the city’s original motivation for creating a small park here had more to do with the large theater, Södra Teatern (map 4), which was built the same year that the square was first planned. The original theater was damaged in the fire, but it was rebuilt by architect Johan Fredrik Åbom in 1859. Södra Teatern wasn’t just a theater but was an entertainment center with a main and several smaller stages, five bars including a champagne bar, a restaurant, a bowling alley, and in the summer, a very popular terrace with live music, dancing, and a bar. The theater was frequented by a much more cultured and elite set than the local neighborhood residents who had a tough time affording enough to eat, much less theater tickets. 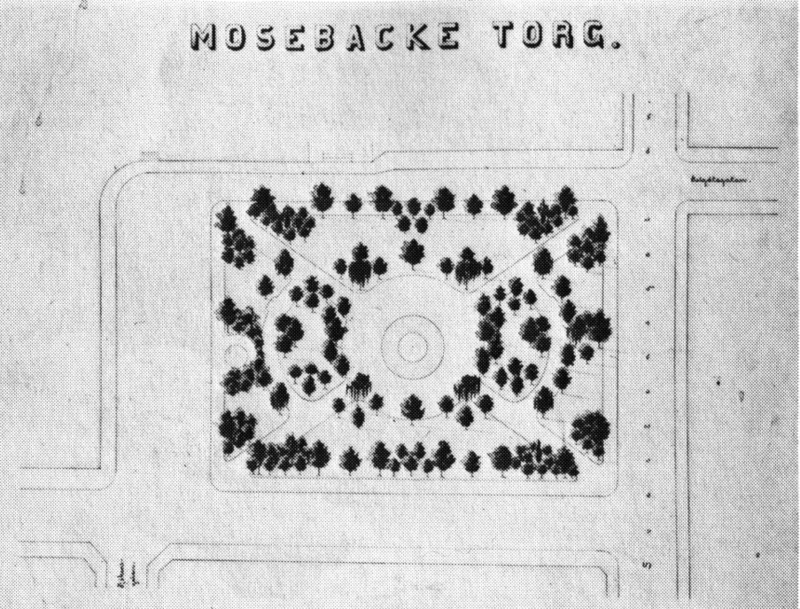 Mosebacke Torg wasn’t Stockholm’s first public green space—Strömparterren opened in 1832 and Berzelli Park was planted in 1852, but even so, Mosebacke was one of Stockholm’s earliest parks or planted squares. 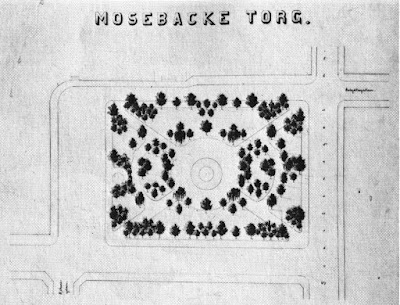 If one accepts my conjecture that Mosebacke was planned in conjunction with the new theater, then all three of Stockholm’s earliest public parks were designed concurrently with the establishment of Stockholm’s nightlife. Strömparterren featured a café and music pavilion; Berzelli featured Bern’s Salon with its bar, café, and music pavilion; and Mosebacke featured the theater, bars, restaurant, bowling alley, and summer dance terrace. These green spaces were built with public funding from the city, but they were made successful and popular due to the private entertainments associated with them. I have no proof of their influence but I can’t help but wonder if the entertainment men also sat on the park planning committees or perhaps contributed funds in some legal or illegal way. Four local streets circulate around the square, but a fifth street, Fiskargatan (Fisherman’s Street), dead-ends into the square with a terraced staircase (map 5). The square itself has only a mild slope, but this staircase is evidence of the area’s extreme topography. At the top of the staircase looms a National Romantic water tower designed in 1895 by architect Ferdinand Broberg. 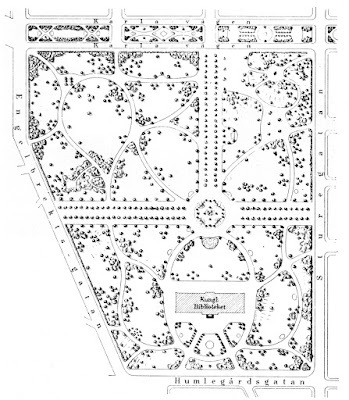 In 1945, the square’s landscape design was renewed. The trees were kept but a large section of square was covered in small paving stones. Sculptures, a small splash pool, benches, and an artistic railing were installed. The square remains much as it was in 1945, complete with the original telephone booth. Like nearby Mariatorget, Mosebacke is an interesting blend between a square and a park. It is too green and lush to be a city square in the traditional sense, but it is too small for leisurely summer picnics and kite flying. It just might be a forerunner to today’s “pocket park.” Mosebacke Square provides just enough open space and just enough greenery to make the densely built-up neighborhood more livable and less claustrophobic. * Nils-Erik Landell, Stockholmskartor (2000). ** Bertil Asker, Stockholms parker innerstaden (1986). P.S. 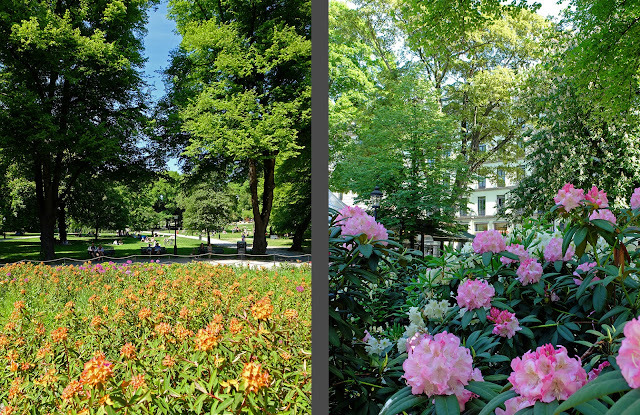 My winter photos don't do the square justice--Mosebacke Torg really is a lovely and well-used space in the summer! Many of Stockholm’s most characteristic and impressive urban design projects were built in the 1600’s specifically to create a capitol city worthy of Sweden’s great empire—projects such as Skeppsbron and the Castle Hill were meant to lift Stockholm from a backwater to one of Europe’s great cities. 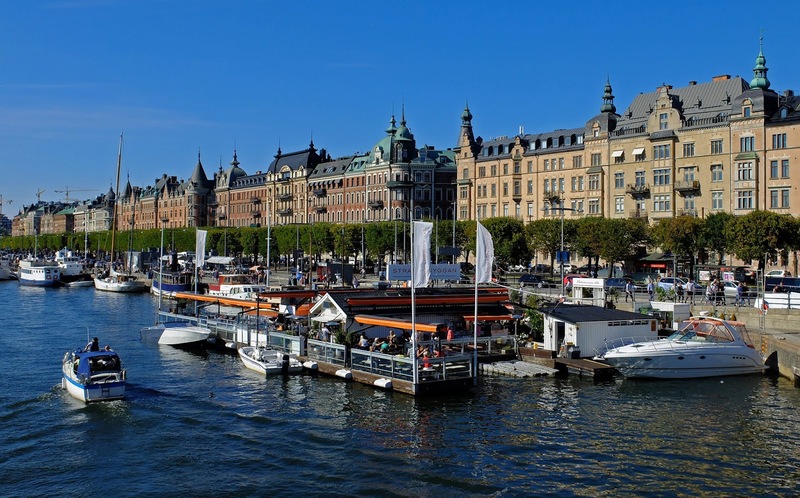 These projects were designed to express Sweden’s status as an international superpower and to impress visitors with Stockholm’s beauty and wealth. But with the fall of the empire and the Crown’s near bankruptcy, both the impetus and the funds were lacking for such boastful, large-scale projects throughout the entire 18th century as well as the first half of the 19th century. Royal and City Architects continued to draw up plans for large-scale urban improvements, but these paper projects were mostly wishful thinking since the political willpower and funding just didn’t exist to carry them out. 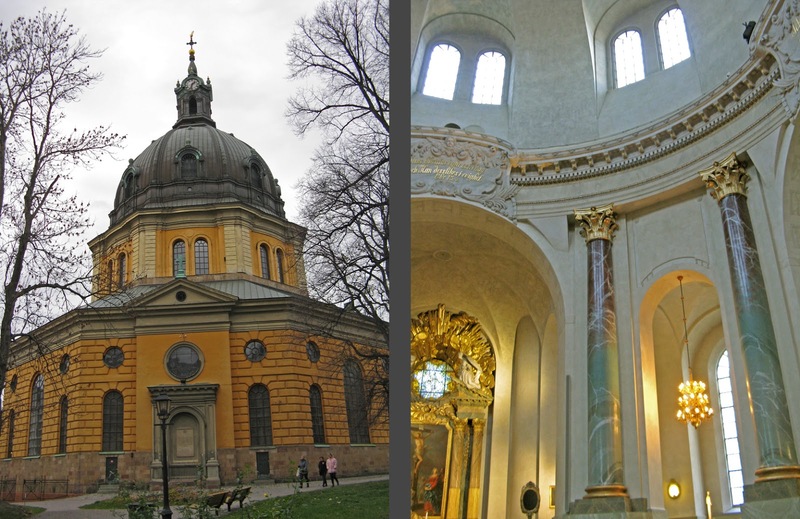 Both Sweden and her capitol city experienced an awakening around 1850. This time, it wasn’t plundering after successful military battles that was behind Sweden’s rising wealth, but technological advancements, innovations, inventions, and industrial-scale exploitation of natural resources. 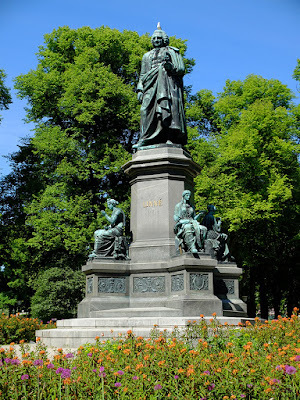 It was during this period that Alfred Nobel invented dynamite which became an unprecedented moneymaker for Sweden (and for Nobel himself, who used his fortune to found and fund the Nobel Prize), and dynamite also allowed unprecedented levels of exploitation of Sweden’s vast iron resources. The invention of the safety match, the zipper, De Laval’s separator (mechanical separation of cream from milk), and the ball bearing were all life-changing inventions that resonated around the world and created huge wealth for Sweden. Ericsson didn’t invent the telephone, but his improvements became international best-sellers. With the advent of the steam-powered saw, Sweden’s vast forests were exploited for timber on a whole new industrial scale, and the timber was exported with huge profit to forest-poor continental Europe. The new influx of money and commercial enterprise created the need and basis for a new, modern banking system which in turn produced even more wealth as well as a new layer of wealthy professionals in the form of bank directors. 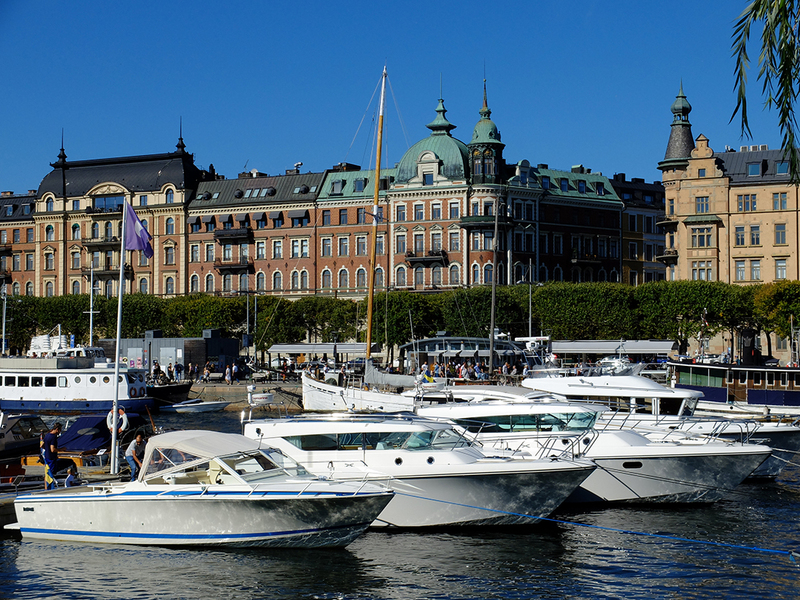 During the previous decades, nearly a million poverty-stricken Swedes immigrated to America; now, Sweden was quickly becoming one of the world’s wealthiest nations. The only problem was that the capitol city was practically stuck in the Middle Ages (or the Renaissance if you’re being generous). In my previous post, I detailed how infrastructure improvements such as clean water were late in coming to Stockholm. It wasn’t just infrastructure that was lagging behind: the entire city was dilapidated, there was a severe housing shortage, and much of the recent building activity consisted of ramshackle shantytowns which were haphazardly and illegally constructed near the booming industrial areas. In the first half of the 19th century, an average of seven or eight new apartment buildings were built in Stockholm each year. But during the wealthy boom years of the 1880’s, an average of 240 apartment buildings were built per year. 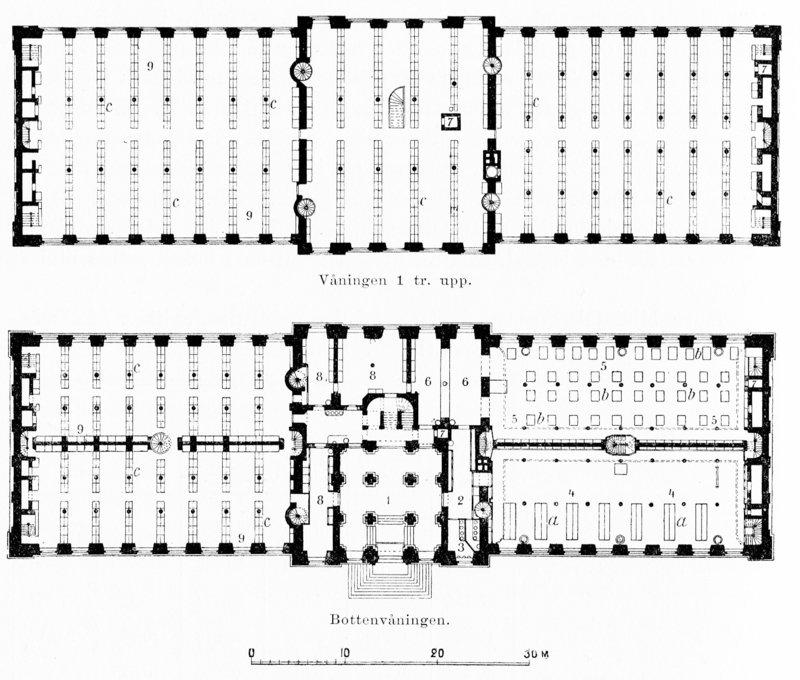 It was in the mid-centuuy setting of dilapidation and stagnation that radical projects such as the demolition and rebuilding of the entire island of Gamla Stan were proposed. 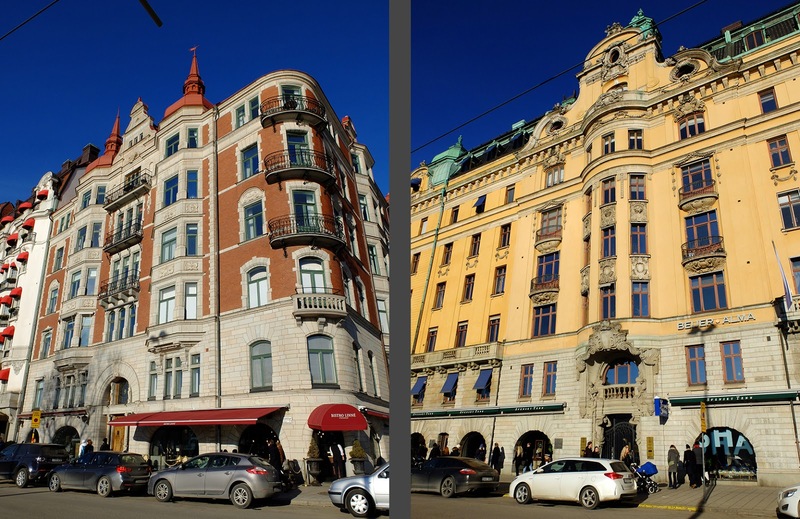 Today, demolishing Stockholm’s (and one of Sweden’s) most historic city centers seems preposterous, but the idea can be understood in light of Stockholm’s dereliction and the severe housing shortage. Something just simply had to be done. 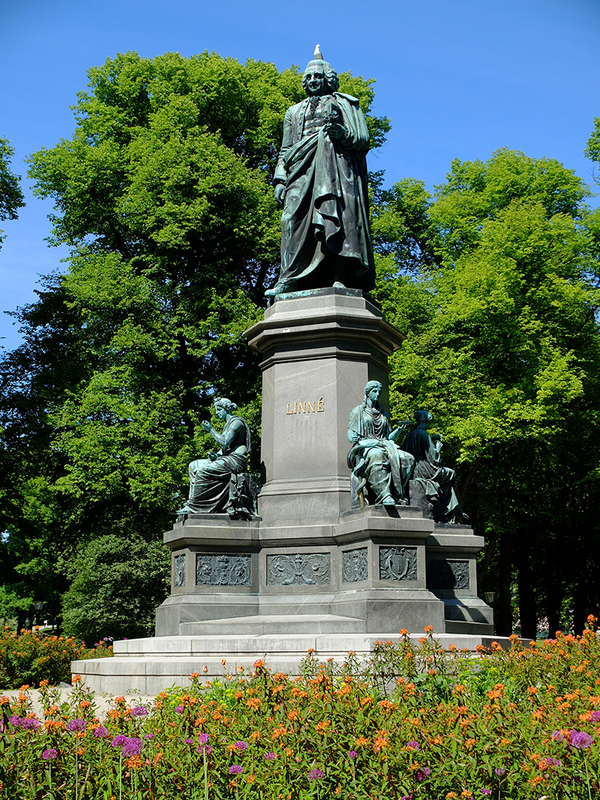 In 1857, a city councilor by the name of Schuldheis called for a new city plan to encourage and direct Stockholm’s growth. In his motion, he specifically mentioned the need for beautiful buildings to embody Sweden’s new prosperity and said that the city’s waterline must be cleaned up. Instead of industrial slums and polluting factories lining the water, he called for grand public walkways along all of Stockholm’s waterways. At the time, this last comment was so unlikely and utopian that he was laughed out of the council chamber, but the idea stuck and grew in Stockholm’s consciousness. Strandvägen, or "Shore Street," was not directly a product of Schuldheis’s motion; instead, it was a directly the result of a more practical matter. The quay at Nybroviken was found to be unstable and near collapse, and uncharacteristic speed was needed to plan, design, and build a new quay. Rothstein drew up the plans for the quay at Nybroviken, and although it wasn’t really supposed to be part of the project, in the spirit of Schuldheis’s he proposed that the grand quay be extended all the way from Nybroviken to Djurgårdsbron, the bridge to the island of Djurgården. Not only did he propose a stone quay crossing what was then farm land sloping down to the water, but he also proposed that the quay be paired with a tree-lined boulevard that was to be lined with stately buildings looking out over the water. Rothstein’s proposal was both visionary and seemingly preposterous. 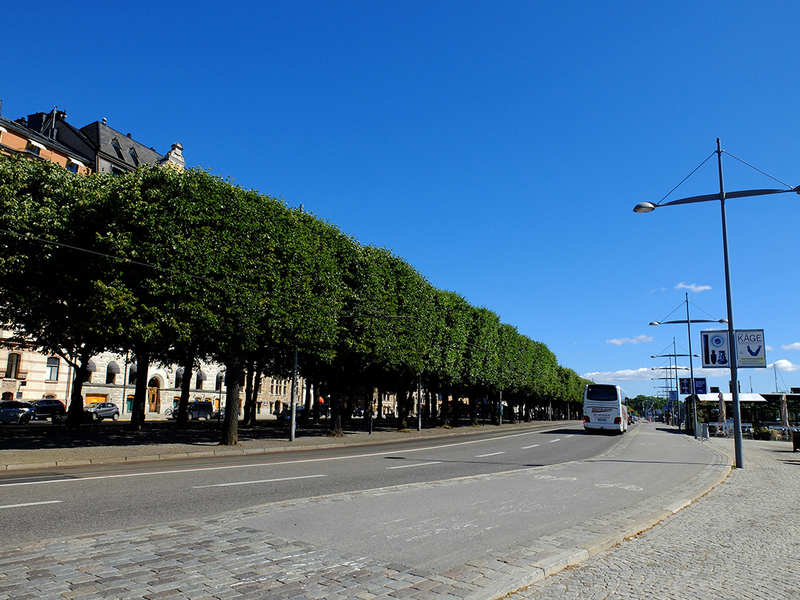 First of all, the boulevard would be adorning one of Stockholm’s poorest areas and thus seemed like a complete waste of resources—who would want to stroll through the slum? 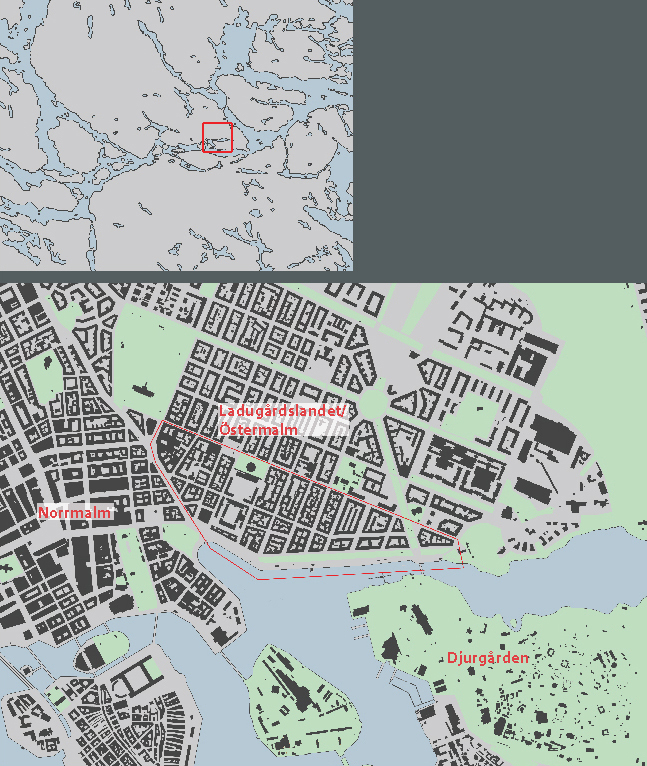 The area east of downtown had been incorporated into Stockholm in the 1600’s as a methodical way to clear Norrmalm of the poor and move them farther from the city center. Additionally, the waterline was literally a series of cow pastures dotted with wooden farm buildings. (The area was known as Ladugårdslandet, or “Barn Land.”) There were countless privately-owned lots along the water’s edge. Storgatan ("Big Street") was the main street leading from central Stockholm through Ladugårdslandet to the island of Djurgården, and it was the traditional overland route to the island. Rothstein’s proposal wasn’t merely to extend the quayside but to expropriate a large number of private lots and to build an unprecedentedly extravagant boulevard, through the poorest area of town, to nowhere. The likes of Rothstein’s boulevard wasn’t even to be found (yet) in Paris. Storgatan, or "Big Street" still has a few reminders of its heyday in the 18th century. The city council dismissed Rothstein’s proposal outright, writing that the project “was really nothing more than ornament and decoration” without any real benefit to the city, and that it was a project that the city could ill-afford. However, Mayor Hamilton saw the potential in Rothstein’s vision and took the proposal to the King. 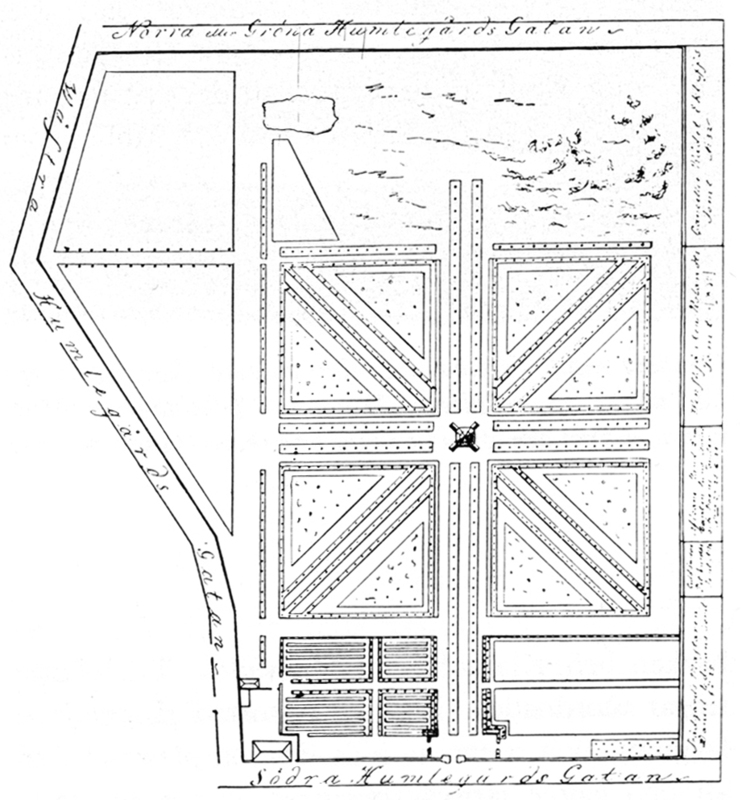 In 1861, the King ordered the city to proceed with Rothstein’s proposal. The city had no other choice, and work began that same year. 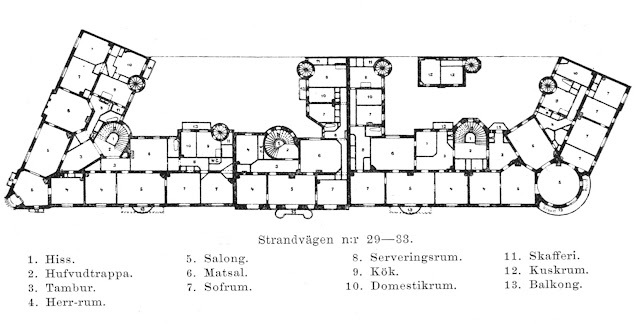 Strangely, I haven’t been able to find any of Rothstein’s drawings, so other than Strandvägen itself, I’m not entirely sure what else was in his proposal. 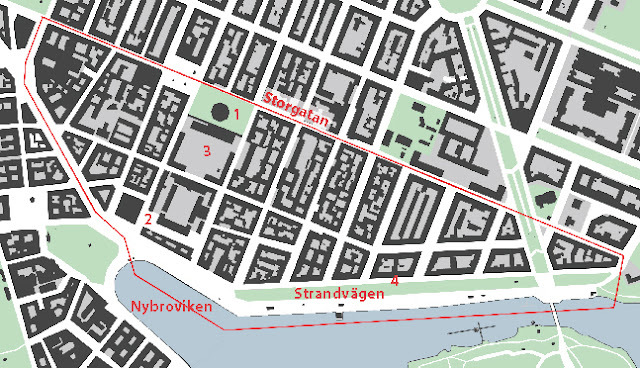 However, I believe that he also drew the blocks between Storgatan and Strandvägen, and that the blocks were a direct expansion of the original city plan from the 1640’s. This plan was a plain gridiron with no subtleties and none of the finesse which matured in Stockholm’s later expansions in the 1880’s. and Artillerigården or Artillery Yard (map 3) (see #6) which was the military’s armory. The quay is very generously dimensioned; it is wide enough to encompass quite large restaurants and bars. then a street heading east, and finally a paved sidewalk at the buildings’ edge. These layers offer a variety of experiences: a waterside stroll, a sunlight dappled promenade, an urban walk. 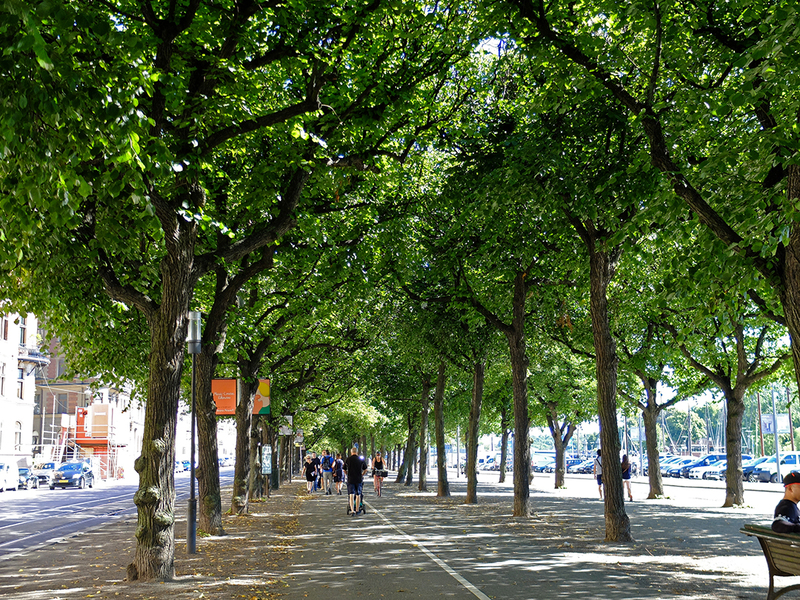 It took fifteen years to fill and build the quay and to pave the street for its entire 740 meter length, and it wasn’t until 1879 that the three rows of trees could be planted. Incorporating a tramline into the boulevard’s layers wasn’t part of Rothstein’s original vision, but at some point during the construction process, a tramline was inserted into the plans. Strandvägen was one of Stockholm’s first horse-drawn tramlines. The tram was perfect for weekend outings to Djurgården and was probably well-used by Strandvägen’s residents commuting into the city for work. Strandvägen can be seen as Stockholm’s first commuter suburb and bedroom community (more on the lack of commercial enterprise on Strandvägen below). 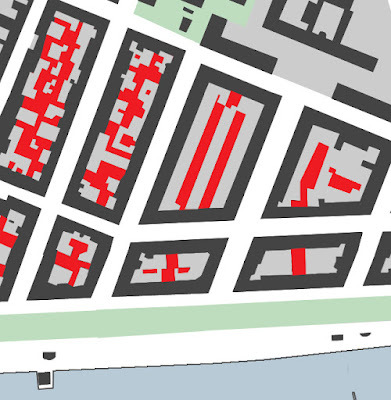 Many of the street names in the Strandvägen development are actually quite old and date back to the 1600’s: Artillerigatan (Artillery Street), Skeppargatan (Sailor Street), Styrmansgatan (Helmsman’s Street) and Kaptensgatan (Captain’s Street) refer to the military activity in the area while Grevgatan (Count Street) refers to a specific Count who used to live in the area. 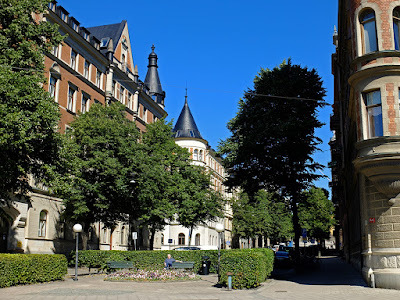 New street names from the time of development include Riddargatan (Knight Street) and Grev Magnigatan (Count Magnus Street, named after a military hero) which aim to extend both the military and the noble tradition of the area. Nobles didn’t feel the need to live in the area, but pretenders could have “noble” addresses. Today, only a select few side streets empty into Strandvägen; most streets have been cut off from this main thoroughfare, I'm guessing as a traffic reducing measure. The dead-end streets have been capped off with small pocket parks, further enhancing the area's park-like nature. 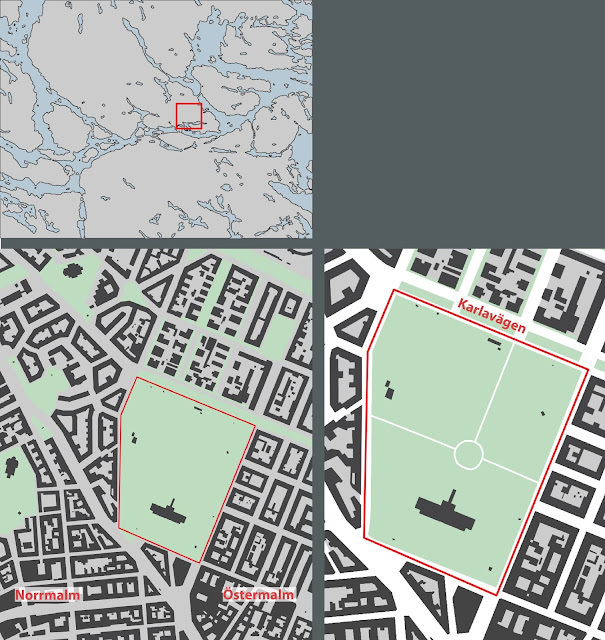 and the closer section facing in to Nybroviken didn’t have the same kind of open water views or the same direct-south orientation. Strandvägen represents a breaking point in Stockholm’s development. Some of the developers were private people who self-financed new buildings containing their own luxurious residence while the other developers were professional enterprises backed by banks. In the winter, the water along Strandvägen freezes. Then it's time for ice skating! The residents of Strandvägen also represent a change in Stockholm’s society. Historically, Sweden’s money and power had both been centered on the aristocracy. But a long progression of events throughout the 18th and early 19th centuries weakened the aristocracy’s position. In the vacuum, Sweden’s entrepreneurs, timber barons, innovators, and bankers took precedence economically if not politically. These “commoners” became extremely wealthy. Like many nouveau riche, they built and bought ostentatious homes for themselves—these nouveau riche didn’t inherit castles and palaces by birth, so they built and bought them instead. 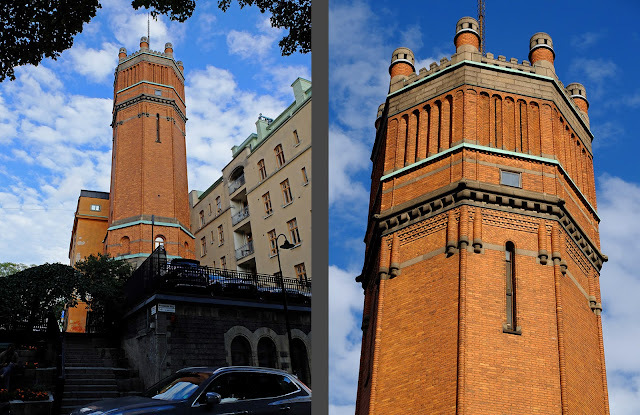 There is nothing subtle or moderate about the buildings along Strandvägen, and a tower marking the corner just wasn't enough. Stylistically, many of Strandvägen’s buildings consciously mimic French chateaux. 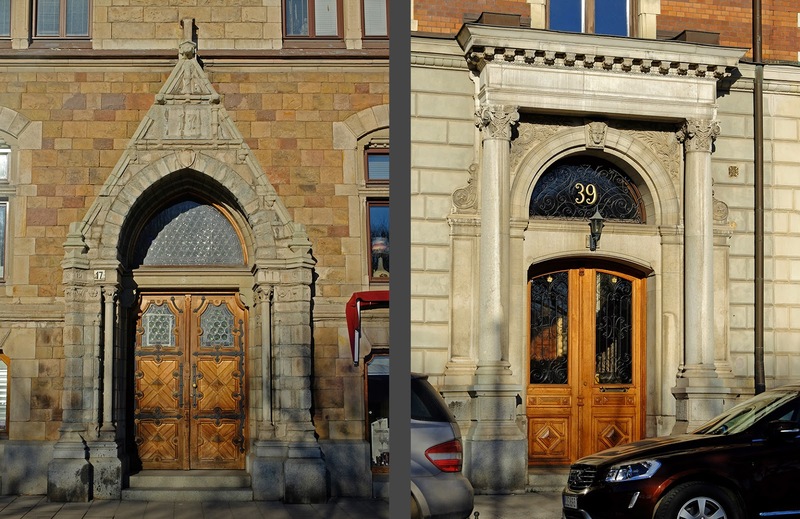 Strandvägen’s most famous building at numbers 29-33 was designed by architect Isak Gustaf Clason in 1888 for timber baron Friedrich Bünsow while the architect was on a grand tour of France and her Renaissance castles (map 4). The apartment building’s towers, high roofs, dormer windows, brickwork, spires, crenellation, turrets, and dominant central pavilion are all elements gathered from French chateaux and applied to the project on Strandvägen. These nouveau French Chateaux are contemporary with Sweden’s National Romantic movement when Sweden re-awoke to her own history and borrowed from the architecture of her most powerful era. Many projects around the country were copying and reinterpreting elements like massive, brick facades from the Vasa Kings’ 16th century castles such as Kalmar and Gripsholm Castles and applying them to modern buildings; Sweden’s past glory was in a sense also copied onto and reinterpreted in these National Romantic projects. But the “common” nouveau riche builders of Strandvägen didn’t look to Sweden’s noble history for inspiration and validation; instead, they looked to France where the monarchies were even richer and even more powerful than Swedens’. It was just another way for the “merchants” to spite the noble classes that they would never become a part of, even if they secretly longed to. 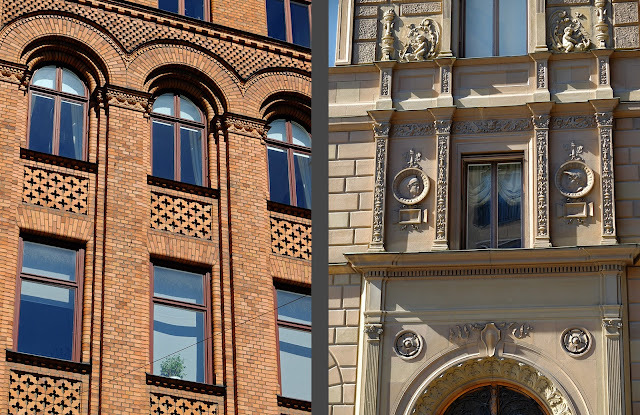 In comparison to Stockholm’s 19th century simple and plain stucco facades, the Bünsow building was extremely ornamental with all of its Loire valley-inspired embellishments. 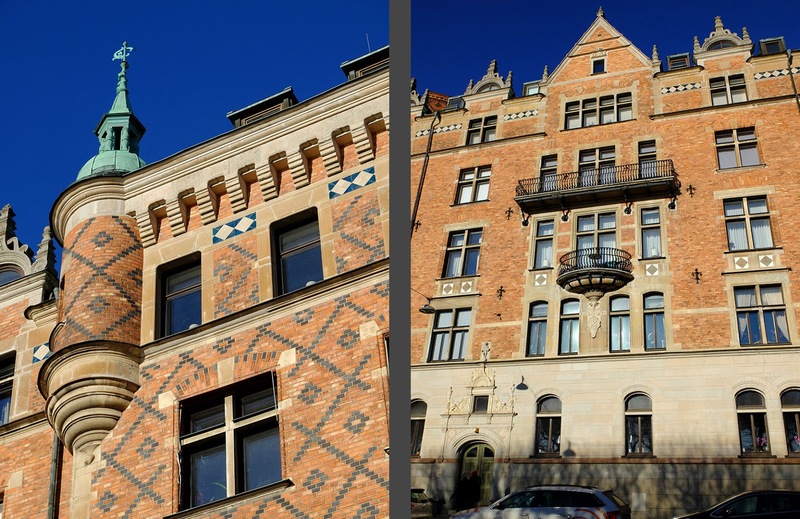 The building also signifies another stylistic development—instead of a stucco covering “hiding” the structural materials of the building, the Bünsow building’s facade featured “natural” and “honest” materials of brick and stone. Brick that was of a good-enough quality to be left uncovered was rare and expensive and most building budgets just didn’t allow for such an extravagance. Other contemporary architects strove for facades of exposed brick and stone but had to make do with imitations in stucco. These off-Strandvägen facades were designed to look like stone and brick (lower right) at a quick first glance. 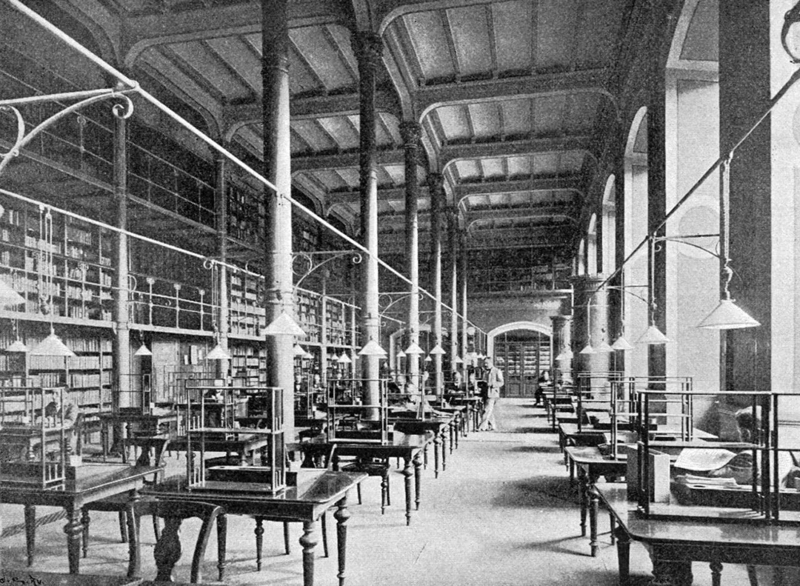 Perhaps the most groundbreaking aspect of Claeson’s design were the windows. 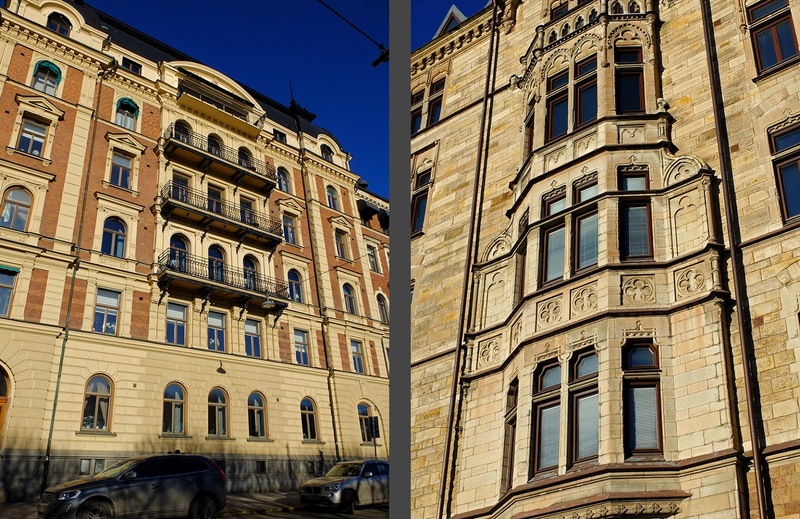 Instead of the same size window marching regularly across the facade at equal intervals, the Bünsow building’s windows are placed according to the interior layout of the rooms. This is one of the first examples of function overriding form, a theme that would continue to develop all the way until today. 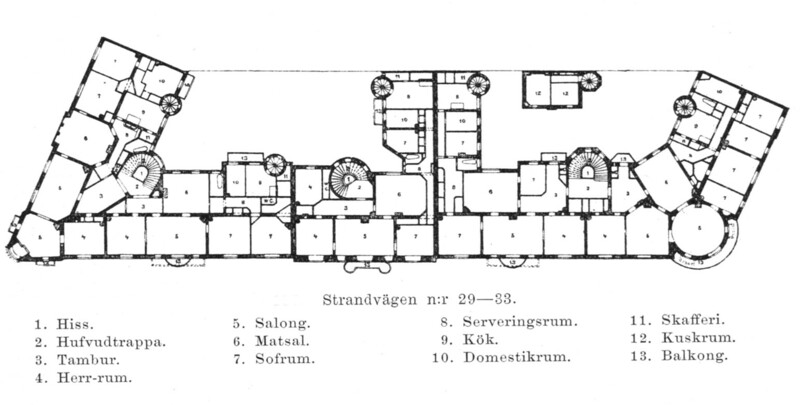 Apartments in the the Bünsow house were extravagantly large and featured six or seven large rooms which were 25-50 square meters each (270-540 square feet) plus a kitchen and maid’s quarters. 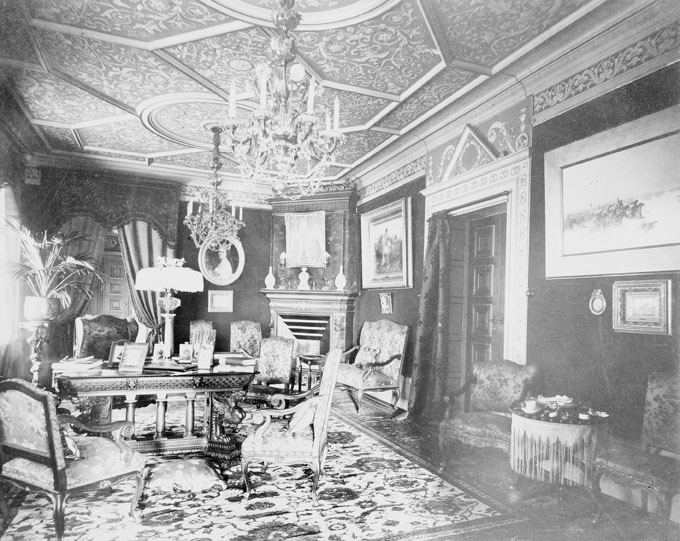 The interiors were lavishly ornamental and true to the Victorian era, each room function featured a different style—Moorish for the gentlemen’s rum and Rococo for the drawing room. 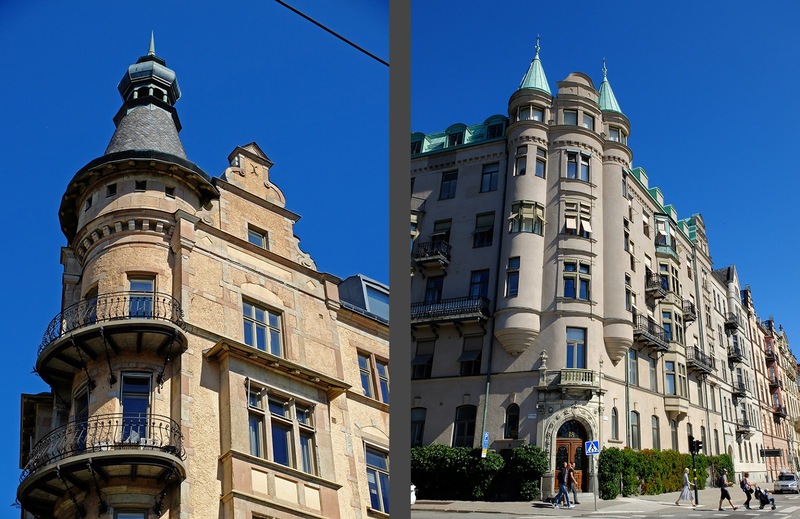 Bünsow occupied one gigantic apartment himself and sold the other street-facing apartments to other nouveau riche. In 1900, the census revealed that Strandvägen’s showy apartments were solely the domain of the nouveau riche: wholesalers, bank directors, military officers, lawyers, and civil servants made up for nearly all of the residents. 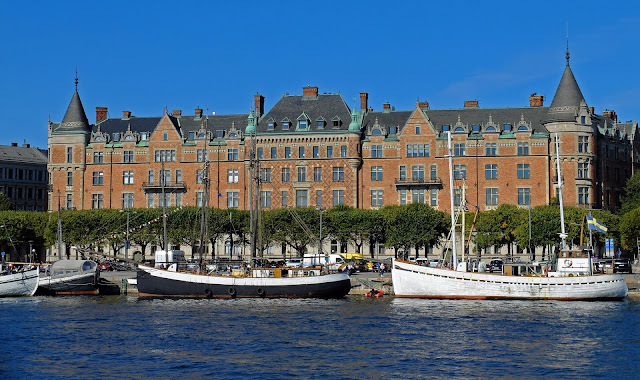 Very few academics, nobles, or culture elites chose to live on Strandvägen. Bünsow’s building was technologically extremely modern for Stockholm. 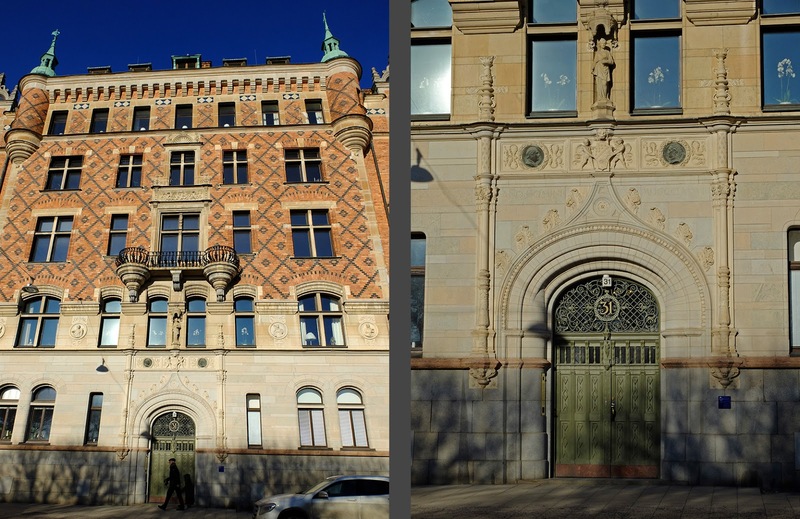 While most buildings in the Strandvägen development were without elevators, central heating, and bathrooms with flush toilets, the Bünsow building had elevators, central heating, and even electricity which was produced by a generator in the basement. 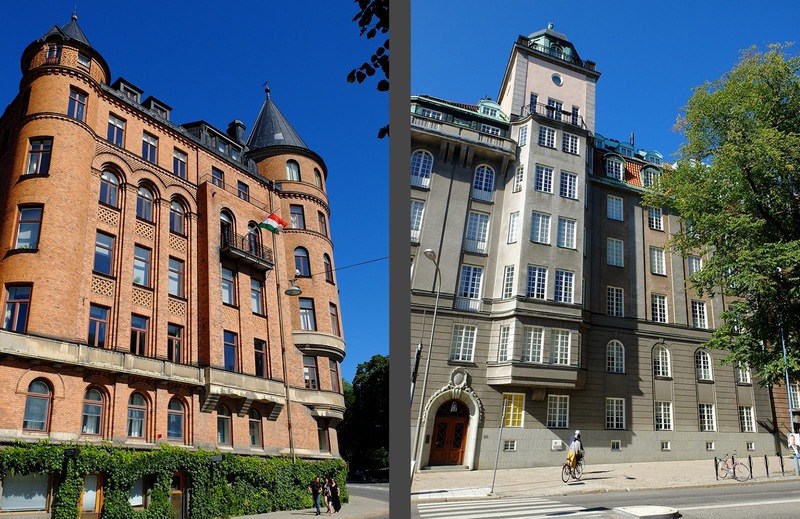 Like Paris, Stockholm’s 19th century apartment buildings featured concierges which kept an eye on everyone coming and going, managed the maintenance staff, took messages, and sorted the mail. The concierge also had keys to all the apartments and could thus let in workmen and water plants while the residents and their staff were away. 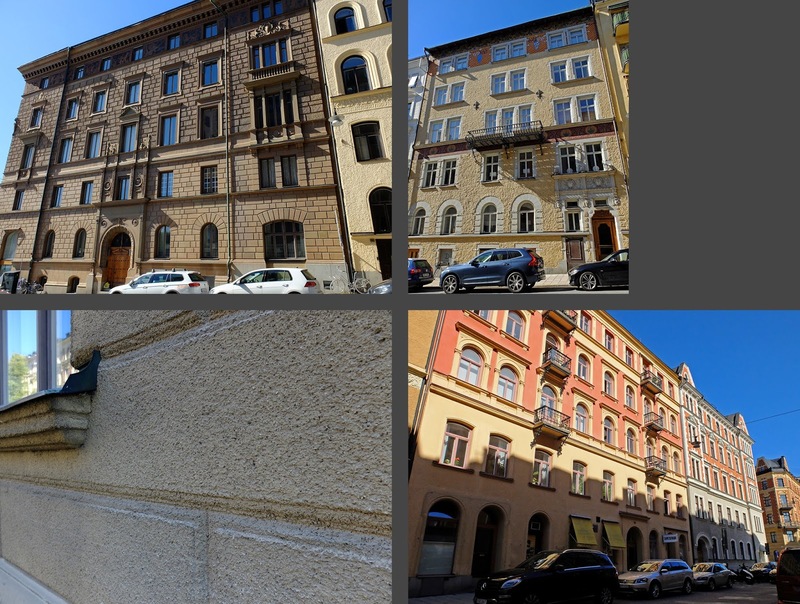 definitely not to the sumptuous degree of Strandvägen’s facades. In the interior of the blocks, small, dark rental apartments were occupied by servants and other low-paid workers such as waiters, tailors, and shop assistants. The dark grey apartments were extremely exclusive while the red apartments were relatively affordable for the working class. These apartments didn’t have any of the status of the street-facing apartments, nor did they have water views or much of the sun and breeze enjoyed by the fancy flats. 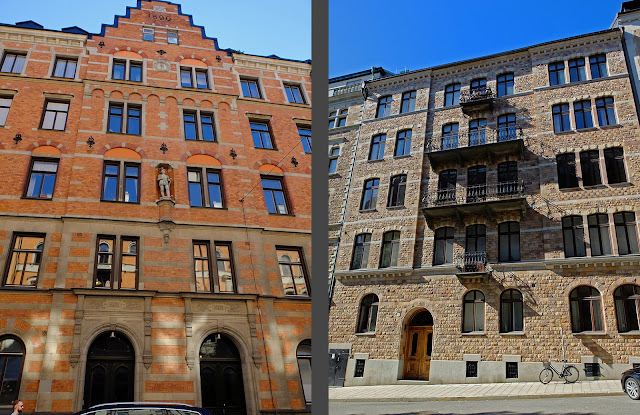 Even so, Strandvägen, for all its glamour and prestige, is an interesting example of mixed income development where wealthy and poor alike shared the same front door. 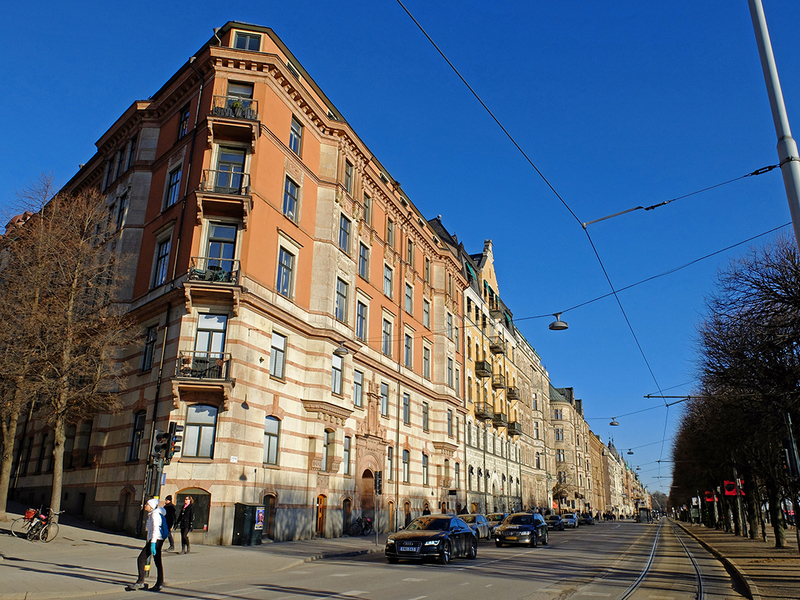 The Strandvägen development was designed as a purely residential neighborhood; no stores, offices, restaurants or cafés were originally meant to occupy the ground floors. The area farthest from town is still completely residential and the streets north of Strandvägen are still strangely devoid of life. But the buildings along Nybroviken were built later, and they were designed to have stores and restaurants along the street. The most famous store is Svenkt Tenn, a home decorating store that has been the stylistic voice of wealthy Stockholm for nearly 100 years. Only the newest buildings along Strandvägen, those closest to downtown, have commercial spaces. Strandvägen was the beginning of Stockholm’s expansion eastward. 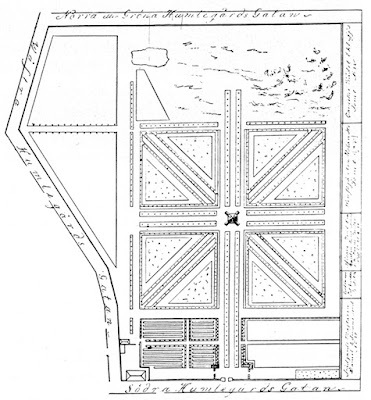 Unconsciously or not, by creating a luxurious boulevard before planning the subsequent expansions, the city planners created a desirable neighborhood to which people flocked. 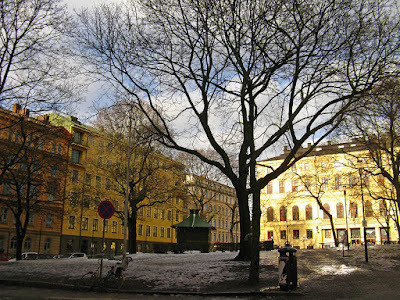 Instead of being regarded as merely an outlying suburb, the area was considered the home of Stockholm’s elite, a reputation which is still upheld today. (There's only one apartment for sale along the street, and it's pre-bidding-war price is $5 million.) 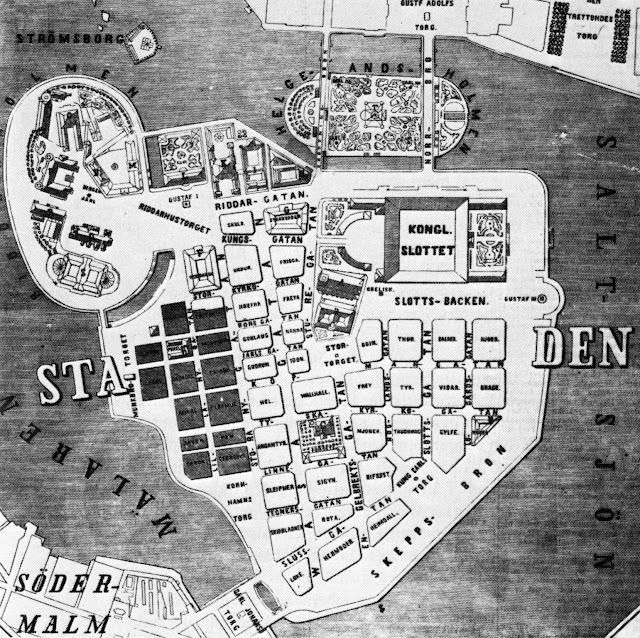 When Strandvägen was planned and developed, the district was known as Ladugårdslandet, or “Barn Land” and had 17,000 residents. But this lowly, rural name was no longer appropriate, and it didn’t resonate with the area’s status, wealth, or exploding population. 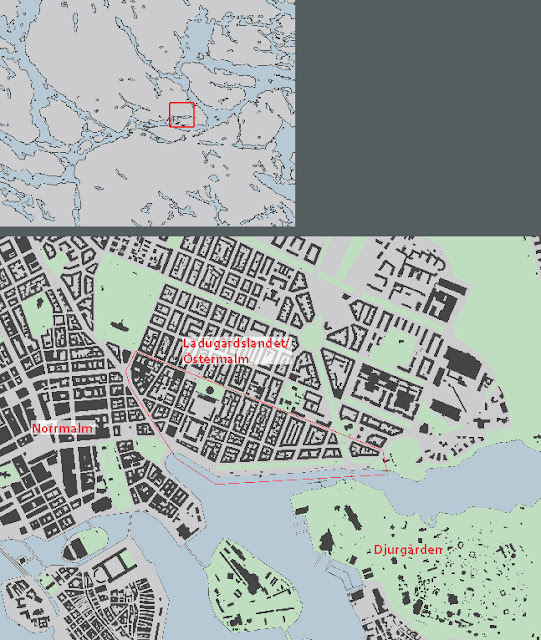 In 1885, more than 40,000 people lived in the district and the name was changed to Östermalm, or “Eastern Area” which was in keeping with the historical areas of Norrmalm (“Northern Area”) and Södermalm (“Southern Area”). 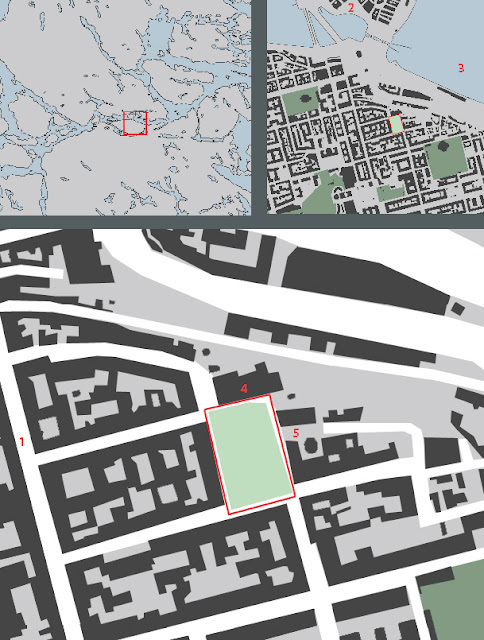 While Strandvägen predated the awakening of city planning as a profession and the more nuanced planning proposals later in the century, the plan contains the bud of several important ideas. 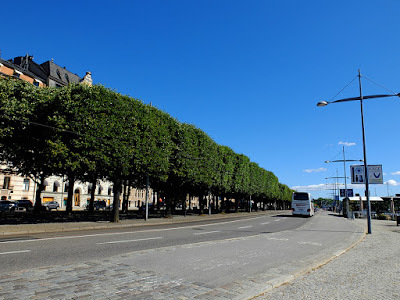 First of all, older plans didn’t allow for differentiation in street widths for primary and secondary streets, but Strandvägen itself is a wide, open boulevard very much in contrast to the relatively narrow “normal” streets like Styrmansgatan which were laid out at the same time. Less grand street widths just off of Strandvägen. Also, the insertion of trees into the urban fabric was a novelty. 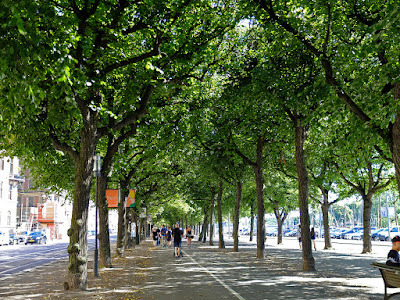 Stockholm’s first public parks at Strömparterren and Berzelli opened a bit before Strandvägen’s genesis, but Strandvägen was the first tree-lined street in Stockholm’s urban context. Additionally, Strandvägen marks a new attitude toward the street. This street wasn’t just an efficient means of transportation; instead, it was a public space meant to be inhabited. One wasn’t just to efficiently move through; one was invited to linger and enjoy. While the aristocracy’s fall was a drawn out affair that had begun a century before, Strandvägen punctuates the end of palace-building in Stockholm. 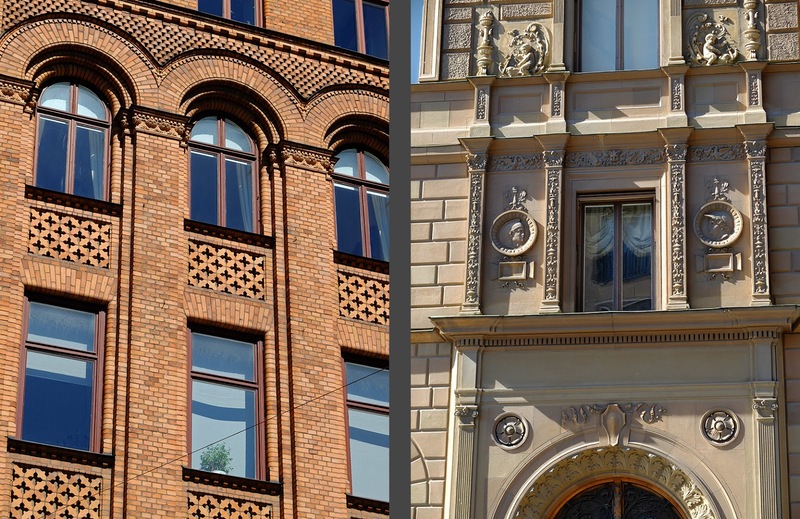 Now, Stockholm’s most exclusive residences were not palaces built for the nobility, but were imitation palaces built by businessmen for businessmen. Strandvägen was consciously designed as a luxurious address lined by palace-like apartment buildings in order to beautify the city’s image and proclaim the city’s wealthy, modern position. At the same time, it was very much a project which benefited the populace as a whole. Strandvägen was an important precedent of the city taking over the privately owned waterfront and turning it over to the public realm. Despite the exclusive nature of the apartments lining the boulevard, the city gave the waterfront to the public. The public has always appreciated this gift. Ever since the boulevard opened, it has streamed with strollers, especially on sunny weekends.